There's so much anticipation for this movie, being a Potterhead myself. Basically, 'Fantastic Beast and Where to Find Them' is a text book used by Harry Potter when he's in Hogwarts. It's written by Newt Scamander and this movie is about Newt's adventure before he actually wrote the text book. You know how Harry Potter movies have a 'dark feeling' around it due to Voldermort? 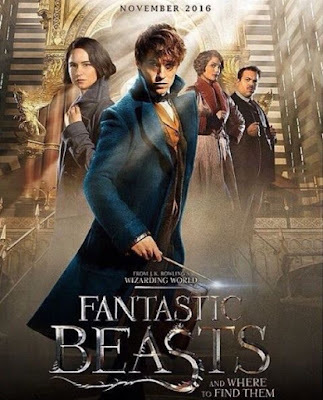 Unlike HP franchise, this movie is exciting with all the magic creatures, the special effects are what you would expect of a Harry Potter's spin-off and it felt very 'light'. Ya know what I mean? The story goes ... Newt came to New York (by the way, the movie is set in the 1900s) with his magic briefcase which was loaded with magical creatures. One of the them, a Niffler (imagined a mini-hairy-black platipus) escaped the briefcase and ran into a bank. A Niffler is a sucker for shining things; coins, gold, bracelets etc. While chasing the Niffler, Newt accidentally dragged Jacob a Muggle or No-Maj (as Americans called it) into the mess as well. Then came an ex Auror, Tina which brought Newt to the MACUSA (American Ministry of Magic) because he was endangering the Wizarding community and not wiping off Jacob's memory. The plot thickens thereoff. I don't want to give too much away. You definitely need to watch it for yourself. They do incorporate many Harry Potter jargons but don't worry. They explains them in the movie which makes is very easy for non-Potterhead to follow the plot. My husband who don't read any HP series loved it too! This movie is the first of a five-series franchise.